Our Three Stone 1 Carat Cubic Zirconia Princess Cut Engraved Anniversary Ring can be worn as an anniversary ring or an engagement ring. This three stone princess cut anniversary ring is beautifully engraved and includes extensive filigree work beneath each of the princess cut stones that include round and heart shaped cut outs. 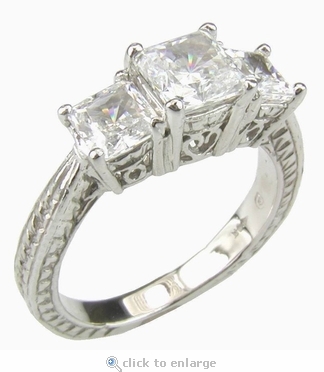 All the details on this three stone princess cut ring are reminiscent of vintage and antique estate styles of jewelry. 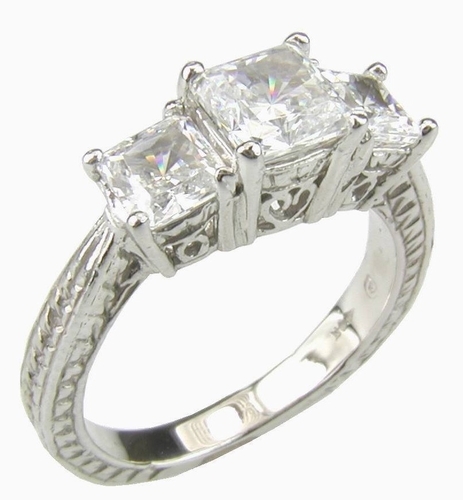 This ring features a 1 carat 6mm diamond look princess cut center stone with .50 carat 4mm square sides. You can also add the band of your choice to make the combination an amazingly personal wedding bridal set. This anniversary ring includes a total carat weight of 2 carats of original Russian formula diamond quality cubic zirconia that are all hand cut and hand polished to exact diamond specifications. Due to extremely low pricing, all clearance sales are final.